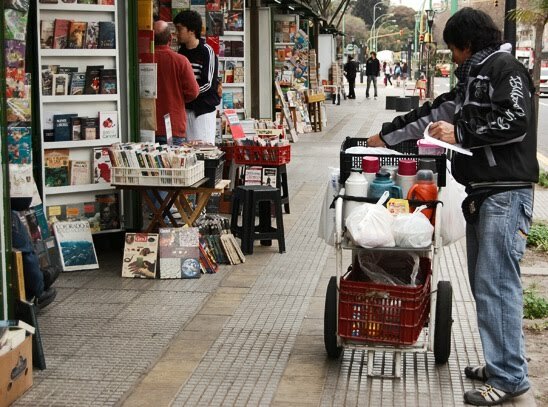 Forrest Gump might have said “Life is like a book store in Buenos Aires.” For a city that abounds with bookstores, it can be surprisingly hard to find what you are looking for. Some stores only sell dusty Argentine pulp, and others have all of your favorites (but not in your favorite language), and when you finally set your weary eyes on an English novel, you will often see Fabio staring back at you. But fear not, for whether you are an expat yearning for literature in your mother tongue, an English teacher in search of interesting materials, or just a centerfold junkie looking to get your fix of that bookstore smell, Buenos Aires has what you are looking for. From the botanical gardens and the municipal zoo, to life size animatronic dinosaurs, Plaza Italia has plenty to offer. But if you happen to tire of seeing mechanical dinos and famished lions, take some time to stroll along the Plaza Italia book market. With over 30 stalls to choose from, you are bound to find a gem, whether new or used, English or Spanish. While some stalls specialize in vintage Spanish language books and magazines, others have decent – albeit random – collections of used American novels. The vendors tend to be very friendly, so feel free to ask for specific books or genres. Indeed, much of the stalls’ collections are not on display, but can be easily accessed by the vendors. Unfortunately, many of the new books are wrapped in plastic, making them impossible to preview. If you do happen to find one that you can leaf through, remember to stay alert for pick pockets, since the Feria is in a very busy part of Palermo. Otherwise, the Feria is a great place to spend an hour on a sunny day, and if you don’t find what you are looking for, you can always go back to electro-rexes and cheerless cheetahs. Entering La Eterna Cadencia is like walking into Jay Gatsby’s library. Dark oak shelves hold neatly placed books from floor to ceiling in the store’s L shaped layout. Walk out to the courtyard and you will find yourself in a well lit terrarium which serves as the Cafe/Bar lounge. Large photographs of Argentine authors from past to present look down on the customers busily typing away on their lap tops, or sneaking a read from the store’s collection (which is allowed, says the manager, only if your really really careful with them!) The cafe’s atmosphere is as peaceful as it is inspiring – peaceful to read, and inspiring to write, or simply to enjoy a hot beverage with friends while lounging in a snug abounding with sofas. Although the place seems like the former study of a great Argentine intellectual, it was built in 2005 and was formerly, and appropriately, a printing factory. While La Eterna Cadencia does have a decent collection of classic non-fiction in English, and plenty of English language travel books, the collection mainly consists of Spanish language texts (of which there is much to choose from). They also offer cultural events including readings, lectures, and debates, all of which are open to the public and scheduled on their web site. Want to take a quick vacation to San Francisco or Seattle? Then just spend as much time as needed in La Boutique del Libro to brighten those homesick blues. This high ceilinged bookstore/cafe is not only reminiscent of the good old US of A in character, it also has a pretty impressive collection of English fiction and non fiction, from classics to contemporary. Don’t expect too much help from the staff (the emo attitude compliments the hipster vibe quite nicely), but feel free to browse their ample selection via sliding ladder. You can also preview any book in the cafe, just make sure you have an ID or some form of collateral in case you get overexcited and spill your coffee. The indoor cafe offers a great, safe place to read, or work on your lap top. It also stays open until 10:00 PM, leaving you plenty of time to busy yourself before those late Argentine suppers. You can also enjoy a range of cultural events, which are hosted up to eight times a month, and listed on their website. Bar or speak easy? Over the table or under? Let’s face it, life under the radar appeals to our adventurous sensibilities, making the clandestine Book Cellar a must for book hunters in Buenos Aires. With no actual store front, The Book Cellar operates via an online book catalogue where clients can choose from over three thousand titles. After placing an order, the buyer is directed to the operation’s headquarters in Belgrano (sorry, there’s no password to get in). Based in a stylish residential building just north of China Town, The Book Cellar’s collection of roughly 10,000 used books is spread from wall to wall of a one bedroom apartment. According to the owner, an expat from the UK, extortionist rent policies keep the Book Cellar under ground (pardon the pun). The savings are noticeably passed on to the customer, with average prices from 20 to 30 pesos per book. While the location and process may deter those travelers looking for a quick grab, The Book Cellar’s buying and exchange policies are ideal for ex pats looking to diversify their libraries. Loads of character and an impressive collection of English titles makes The Book Cellar a very close second on our list. Find out more here. Appropriately located on Estados Unidos in San Telmo, Walrus Books is the quintessential used book store. Although a bit smaller than the other locales on our list, what separates Walrus from the rest is that all of their books are in English. Indeed, from anatomy to zoology, you are bound to find something to your liking. 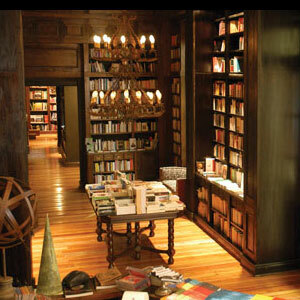 After operating as a clandestine book store for two years, Walrus opened its location in San Telmo five years ago. 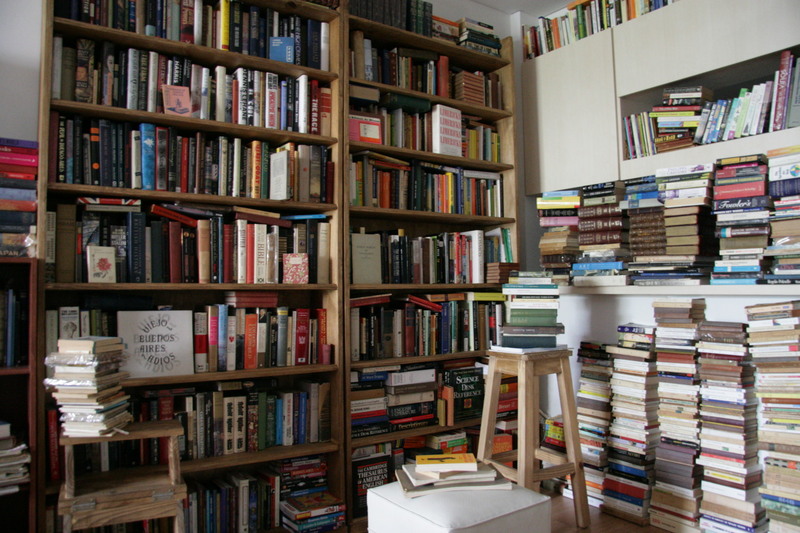 Their collection of over four thousand titles is sustained by yearly shipments from book fairs in the US, giving Walrus a consistent and eclectic inventory to choose from. The prices are reasonable – 40 pesos average – especially considering the convenient location. While Walrus will buy used books in good condition, they also have a decent exchange policy. If you are a literate anglophone in Buenos Aires (that means you, reader!) then there is no excuse not to swing by Walrus Books and see what they have to offer. And yes, it does have that used book store smell. El Ateneo should make the list for its sheer beauty and uniqueness if for no other reason. I think it is stunning and a wonderful use for an old theater. Well said, Mr. Rathbone. It is indeed a site to behold. Very nice – loved the pictures too! Kel didn’t make the list? All books are in English in their stores and they have several branches in different areas. Does anyone know where I can buy (new or second-hand) CUTTING FOR STONE by Abraham Verghese? You should include “Entre Libros” ( http://www.entrelibros.com.ar) as a most interesting bookshop (actually, two locations….) with a wide variety of good material in English, many out of print or otherwise unavailable titles…. I used to go to the Belgrano R branch. It’s located just one block from the Belgrano R train station. The shop is in a lovely old house and after buying books you can either go for a walk around the area (Avenida Melian, Avenida Naon, Conde, Echeverria, Juramento…the houses around this side of Belgrano are gorgeous. There’s the park, right across from the bookshop there’s a Tea Connection confiteria, there’s also the Confiteria El Torreon, a Maru Botana shop (her specialties are sweets and cakes, but I think she has a varied menu of tartas and salads as well) and icecream shop. I agree with some of the comments suggesting KEL Ediciones into the list, but the place does not have the cozy atmosphere of the ones that did cut the list. Walrus Books is by far my favourite. Loved the article. I live in Belgrano R and only knew Kel Ediciones. Now I’ve fulfilled myself with new stores, particularly looking forward to visit Walrus Books and La Eterna Cadencia. 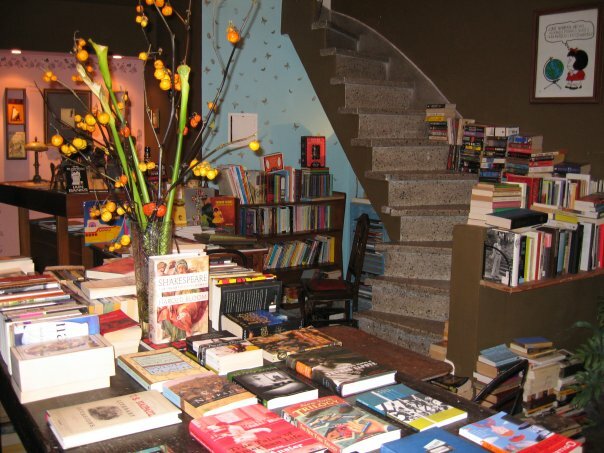 Continued Search for the Perfect Café/Bookstore | it's about argen-time! “I Lose Myself When You Look At Me Like That” | it's about argen-time!